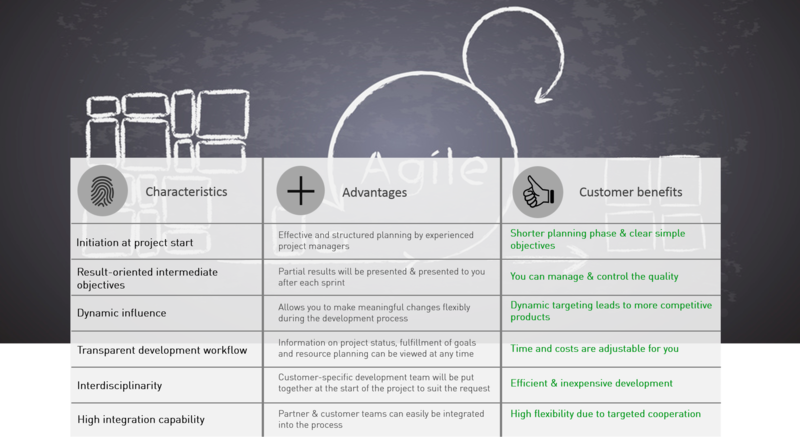 Your benefits because of our agile product development model - a-stautenbergs Webseite! Using our methods and by incrementally splitting, structuring and prioritising more complex solutions, we save time in the planning phase. Development increments, which are decisive for the function of the product, are solved and verified first. Our model enables us to adjust the direction within longer development projects and thus prevent products from being developed outside the target market. Furthermore, by presenting the intermediate results after each sprint, the quality achieved within the time span can be clearly determined and can be controlled by the customer. Open communication in the process is our claim. This forms the basis for successful project completion and long-term partnerships. Because of the verifiable intermediate goals and the transparent monitoring, problem areas are detected very early in the development process. These are processed in a more focused manner by reprioritization. This counteracts any endangerment of the overall project and the schedule. Efficient solutions are guaranteed by the interdisciplinary composition of developers. Furthermore, customer teams and partner companies can also be integrated into the process in order to comprehensively represent an addition to the range of services.